customers have to choose from high top vs. low top shoes, the fact that there are three different types of spikes makes this an overwhelming task for almost everyone. We’ve prepared this guide, after thorough research and testing a series of equipment, incorporating the top 7 best softball cleats of the modern era. All of these shoes are of the highest quality, which means that depending on your convenience, you can choose any one of them for getting the best of traction, performance, and comfortability on the bases. Click “Check Price” to view more sizes. The Mizuno Women’s 9 Spike 4 is one of the best softball cleats which you could purchase. 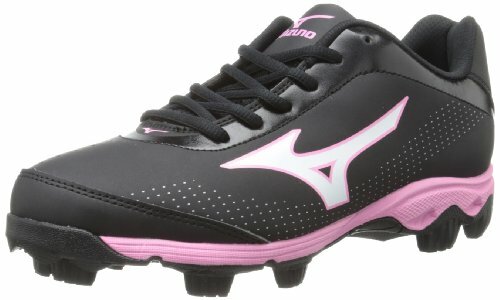 Featuring a perfect combo of comfort and durability, this shoe allows its wearer to give her 100% traction on the field. This shoe has a lace-up closure system along with a padded “booty” tongue which is designed to give you a precise fit. There are several small spots on the shoe’s upper which facilitates a regular passage of air at all times. The upper is made of synthetic leather which requires a minimal break-in period. The manufacturer has also integrated a special mesh lining which means that you don’t have to suffer from wet feet at the end of the day. The 9 Spike Swift with a full-length midsole which provides excellent support and flawless cushioning underneath your feet. The overall weight of this equipment is just above 11oz which makes it one of the lightest softball cleats in today’s market. 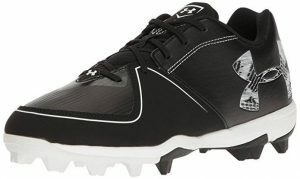 Furthermore, this softball cleat features an aggressive 9-spike outsole which makes sure that once you put your feet on the ground, it stays there without any slippage. Combine it with its lightweight design and the Mizuno 9 Spike Swift offers an optimal fusion of speed, traction and comfortability. Finally, it is available in no less than 11 different designs which mean that depending on your fashion sense; you can purchase this beauty in your favorite color scheme. Having said that, proper sizing seems to be an issue with this particular product. So it might be a bit beneficial to order ½ — 1 size larger than your actual feet dimensions. Featuring a low-top design, the Under Armour Women’s Glyde RM Softball Cleats is one of the least expensive cleats in this list. Available at an inexpensive price tag, this shoe is ideal for all those shoppers looking to make this purchase while living within their budget. And when it is available in three different color schemes, including a stylish black/cerise fusion, almost everyone can purchase it in their favorite design. The upper of this shoe is made of engineered synthetic materials along with a special textile coating on its forefoot region. When the use of synthetic materials makes it a lightweight footwear, the textile coating imparts a much-needed durability to this product. These are extremely comfortable cleats which you can wear for several hours every day. Inside the Glyde RM is the full-length Armourbound midsole which provides exceptional cushioning along with superior shock absorption. As you take one step after the other on the field, the midsole works extremely well when it comes to protecting your feet from any fatigue. Also, it also protects you from the studs’ impact which is a great virtue if you’re going to play this sport for extended periods. On the bottom of this shoe are the rubber cleats which provides excellent traction. These are molded cleats which mean that you can wear this shoe on a variety of surfaces. Moreover, these cleats do an outstanding job for improving the Glyde RM’s shock immersion ability. The Adidas Performance Women’s PowerAlley 2 has a stylish upper incorporating a stylish, 3-stripes design. The upper features a stylish Shockweb graphic print design which is extremely eye-catching. This is a super-lightweight shoe weighing as low as just 11oz. It features a combination upper of Nubuck + synthetic leather for added comfort and durability. It also has the ADITUFF which is specially added to the toe area of this cleat for making it highly resistant towards abrasion. The PowerAlley 2 comes with an ultra-light EVA midsole which runs along the entire length of this shoe. It also has an internal shank plate which is designed to provide you with additional stability. This feature, when combined with the EVA Midsole, protects you and your feet from any fatigue. For keeping your feet dry on a consistent basis, Adidas have employed a hi-tech OrthoLite sock liner inside the PowerAlley 2. Now what it does is as you spend countless hours on the field, it wicks the moisture away from your feet. Eventually, you’re left with cooler, comfier and drier feet which allow you to give your fullest without worrying about your feet’s physical health. Moreover, this softball cleat has a great lace-up design for a precise fit along with an external help clip for keeping your foot in place. Coming towards the PROTRAX cleat configuration, it is specifically designed in such a way to help you move laterally and rotationally without any hindrance. So if you’re looking for a high-performing cleat for softball, the PowerAlley 2 can be your best bet. The Nike Women’s Hyperdiamond Strike comes with a synthetic leather upper which makes it a pretty lightweight footwear for the softball enthusiasts. Featuring a low cut design, which allows users to run faster on the field with negligible resistance, the Hyperdiamond Strike comes integrated with a Phylon Midsole. Made of EVA foam pellets, this is a highly responsive cushioning system which is extremely lightweight. Not only that, but it also delivers a low to the ground feel which ultimately protects the wearer of this shoe from unwanted fatigue. For assisting lateral as well as rotational movement on the field, this shoe has an intuitive 9-cleat configuration integrated on its TPU outsole. 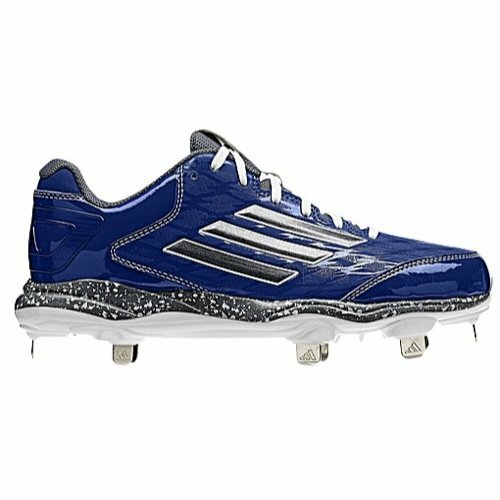 As evident from the name of this product, all of these are metal cleats which are designed to give you the best of traction, speed, and agility on the diamond. Thanks to such a construction, it is best suited to all those players who’re pretty agile in their game. It features a lightweight construction, and when you might want to run faster on the field, this shoe will assist you every bit. However, if you’ve suffered some ankle injuries in the past, the low-cut design of the Nike Hyperdiamond Strike offers negligible ankle support. Otherwise, it is still a high-performing shoe designed for the players looking to make their name in this sport. 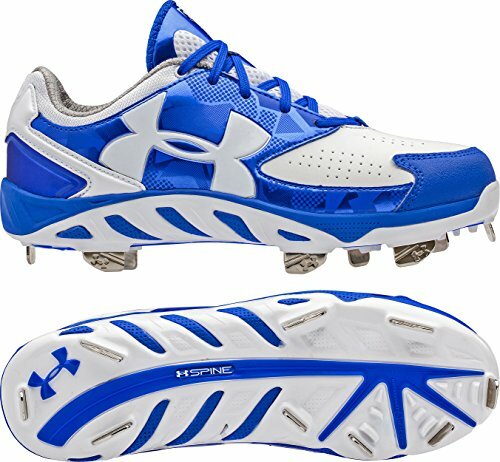 The Under Armour Women’s UA Spine Glyde has got everything which a player might look for in her ideal pair of softball cleats. Under Armour makes the upper of this shoe with synthetic leather which delivers a successful fusion of durability and high-performance. 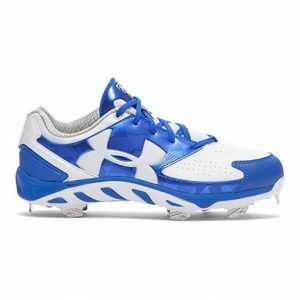 As you could expect from its low-cut design, this is an ideal footwear for fast pitch where a player demands utmost agility from her footwear. However, if you’re aren’t quite agile in your play, this shoe has still a lot to offer apart from its agile construction. If you’re a pitcher, who often complain about her shoes wearing down even before one full season, the UA Spine Glyde comes with a special abrasion resistant toe piece. This feature provides valuable protection to your feet as you’re dragging your toes down before pitching the ball. For providing support to the wearer’s foot, the UA Spine Glyde has made use of two different technologies. Firstly, the special spine chassis midsole provides support to your feet from the forefront to the heel region. Then comes the Molded 4D Foam insole which, after a short break-in period, forms itself as per the shape of your feet. From there on in, it wraps around your feet providing a much secured and comfortable fit. Another impressive feature in this shoe is its rotational traction cleat configuration which is designed with its rubber outsole. Apart from running forward at an enhanced rate, this configuration allows its wearer to change directions without much hindrance. Eventually, it translates into better traction and a superior foot support. The Mizuno Women’s Finch Franchise 5 is a versatile pair of softball cleats which can be worn on a variety of surfaces. Incorporating rubber studs, you can use this shoe on almost any kind of field, and it will give you the best of durability and comfort. Incorporating a synthetic leather upper, the Finch Franchise 5 has a full-length midsole. When the former increases the lifespan of this product, the latter makes sure that the wearer stays comfortable through his stay inside this product. It also has an additionally padded tongue which restricts dust and grass from entering this footwear. This particular feature is of great essence especially if you’re going to play in wet outdoors. The bottom of this shoe has molded spikes, and even though they are non-replaceable, the fact that there are 9 of them designed on its synthetic outsole gives you a handful of grip. As already described, these are all rubber cleats which means you can use them in almost any league type without any restriction. Furthermore, the Finch Franchise 5 Softball cleats are available in two different designs. You can order them in black and white color scheme and if you want to make a bit of fashion statement, consider going with the black and pink fusion. So when Mizuno has more than ten decades of experience, this product has done no harm to such a trusted developer of sporting footwear. the fast pitch. 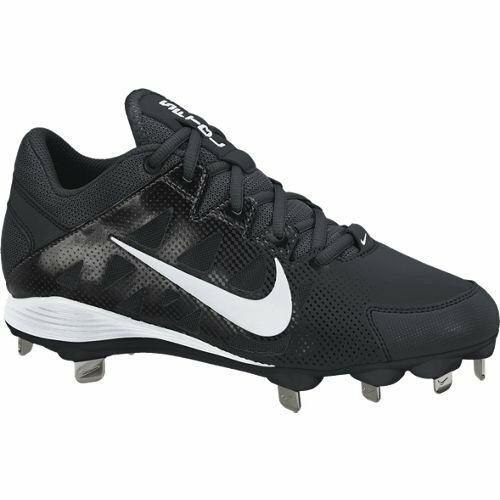 Especially if you’re a young player, who is going to play on a variety of field types, this is one of the best softball cleats which you could buy from today’s marketplace. 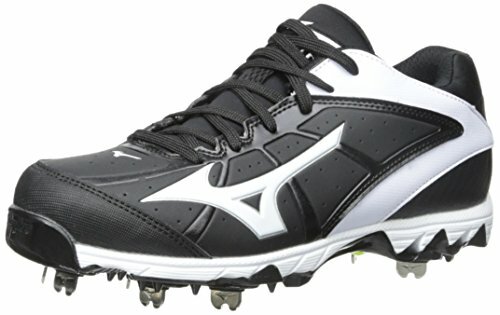 Featuring a synthetic leather upper, this is a highly breathable shoe for the fans of softball. It also has a full-length midsole which makes sure that your foot is provided with maximum cushioning from heel to the forefront. Also, it also helps in reducing the pressure generated by cleats as you take one step after the other. The 9-spike outsole is designed in such a way that you’ll be able to get the maximum support, stability, and traction out of this footwear. It also a unique layout and when all of its studs are made of rubber, this is an ideal footwear for all field types. As per the lacing system, they are easy to adjust and once fully tightened, you don’t have to turn towards the laces for a good amount of time. This lightweight cleat comes in two different designs, both of whom are pretty stylish. 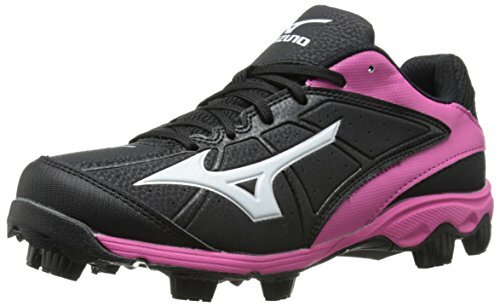 So if you’re looking for a high-performing softball cleat within a reasonable price tag, the Mizuno Women’s p Spike ADV Finch is worth a shot. 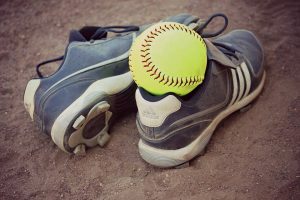 When it comes to purchasing the best softball cleats, one has to consider several crucial aspects of this product. You will have to decide between metal vs. molded cleats, the material of construction. Low-cut vs. high-cut shoes, length of the studs along with several other features. Here are a few things to ponder which will make this purchase easier and a more successful one for our valuable readers. 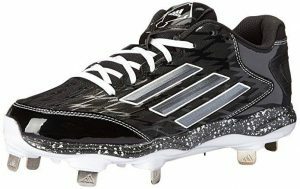 Metal vs. Molded Cleats: Molded cleats provide a much better degree of traction as compared to that of molded cleats. However, thanks to their aggressive nature, which can cause serious injury to your opponent’s leg, the metal cleats are banned by most of the amateur as well as youth leagues. On the contrary, there is no such issue with molded cleats which can be used on a variety of field types. They are mostly made of plastic or rubber, and molded cleats are much more durable than their metal counterparts. Low-Cut vs. High-Cut: For a player dealing with ankle injuries, it is recommended to go with high-cut softball cleats. Having a greater protection around your ankle, they keep your ankle from rolling. However, for the agile set of players, the low-cut shoes are often the safe bet. Lighter in weight, it allows the wearer to run quicker because this type of softball cleats are bereft of any protection around your ankles. The material of Construction: When it comes to traditional cleats, they are mostly made of leather. With better breathability characteristics, leather cleats are also quite durable. However, when they are quite expensive as well, players often turn towards synthetic in search of an affordable pair of best softball cleats. Length of the Stud: Nowadays, some cleats come with the choice of using the studs of one’s personal preference. If you’re going to play on hard surfaces, shorter studs work much better on any such terrain. However, in case of a soft playing surface, go for the longer studs.